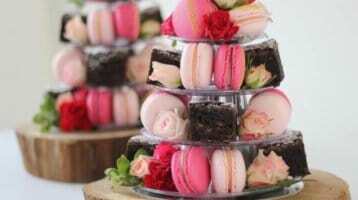 Our Macaron Towers, Sydney | Let’s face it, everyone loves macarons. 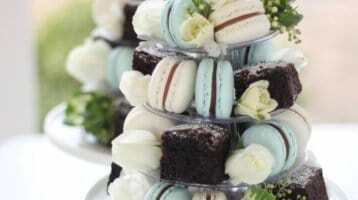 Not only do they look beautiful, but when done right they taste like a little piece of heaven. 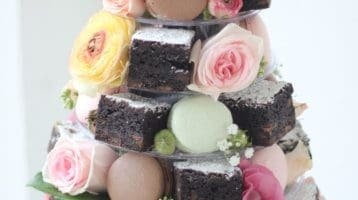 …and Belgian chocolate brownies? Show me a girl who doesn’t love chocolate. I mean, seriously. 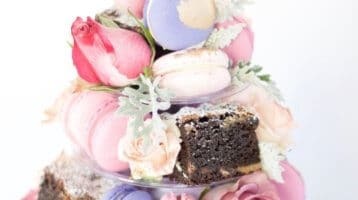 Here at Coco & Bean we have combined our expertise in making luxurious brownies and artisan French macarons to provide our own twist on the macaron tower. 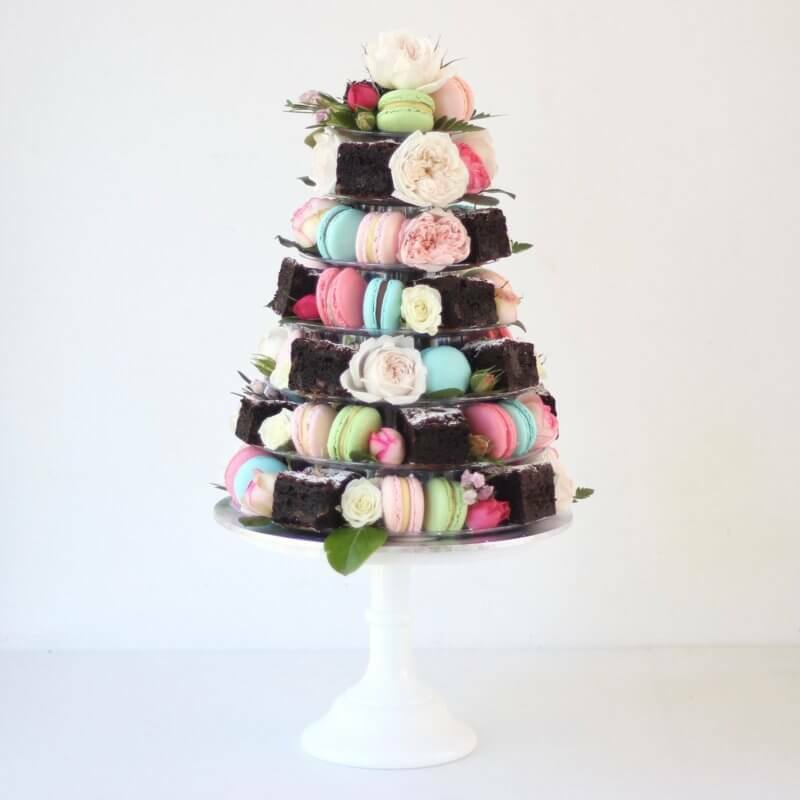 Now you can create your ultimate Sydney brownie, macaron and flower tower. 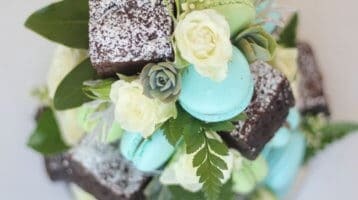 In our macaron towers, we lovingly combine the very best of French design and bespoke colours to suit the theme of your next Sydney event. 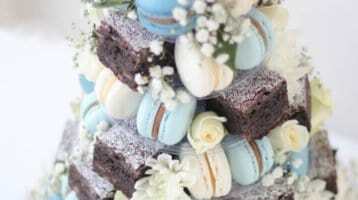 Whether you’re organising an event for your business; a baby shower (sweet! ), wedding, anniversary or birthday, this is a hand-made centrepiece that’s going to give your event the ‘wow’ factor you’re looking for. 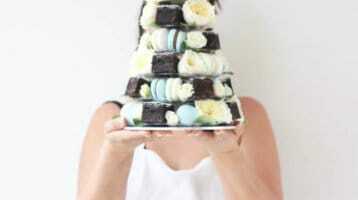 Now your only problem is, how many tiers and what colours? 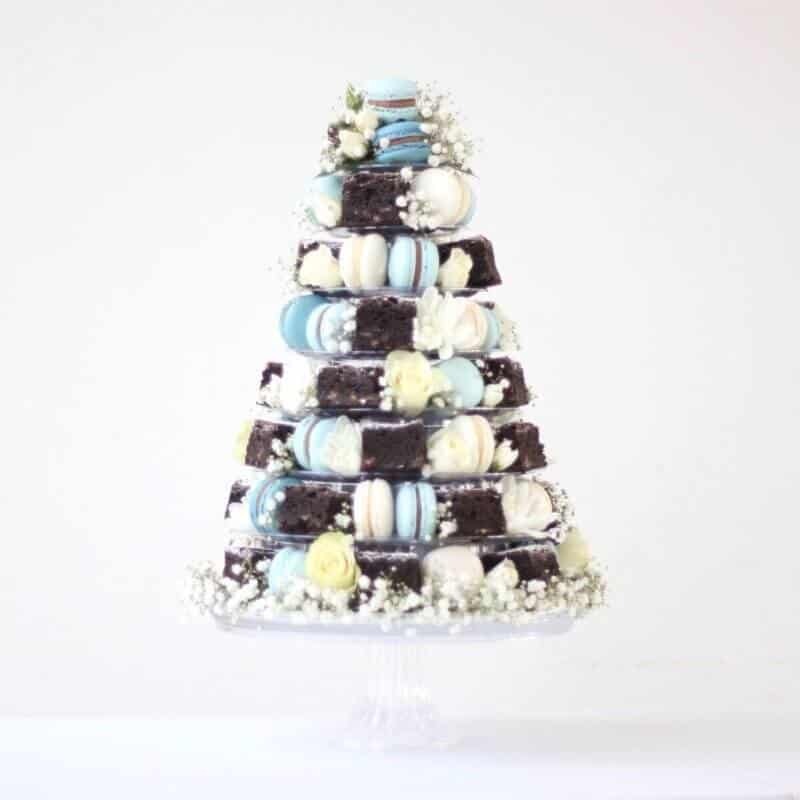 This is our entry level French Macaron Tower. 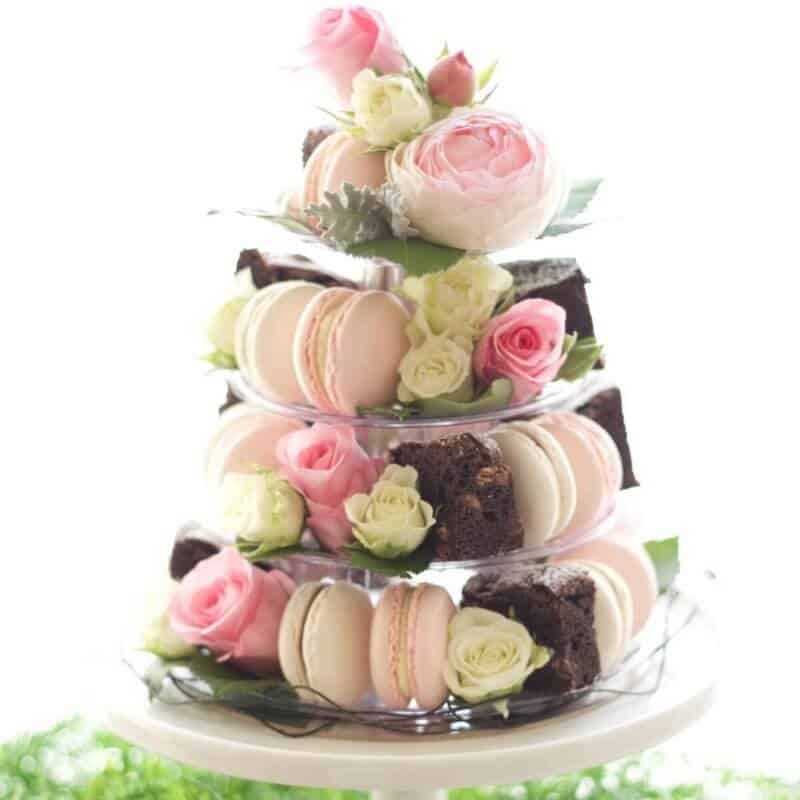 It is a beautiful 4 tier tower containing 11 French Macarons; 11 Belgian Chocolate brownies,; and fresh roses / foliage to suit your theme. We have used other flowers in the past if roses are not your thing and always source fresh seasonal varieties from the local markets. Some of our clients have bought several of these 4 tier towers to put at each table, or to space out on a longer table between seated guests. Stunning! 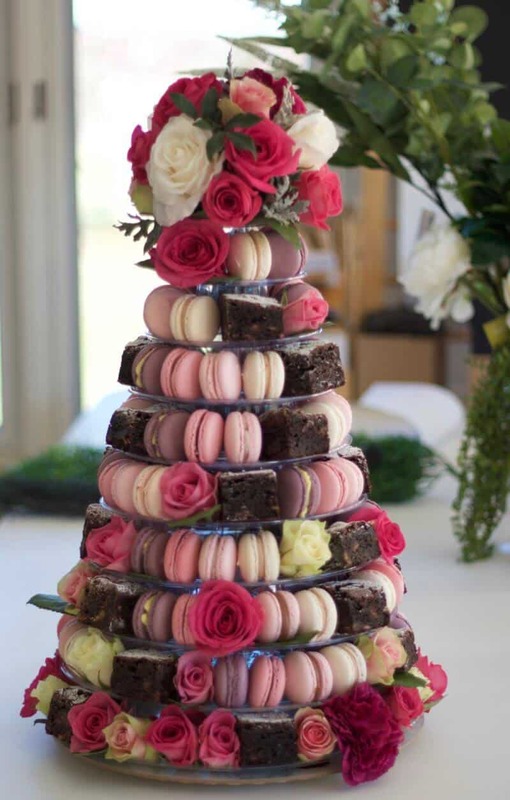 This gorgeous 7 tier French Macaron and Chocolate Brownie Tower holds 45 servings; with 23 macarons and 23 belgian chocolate brownies. 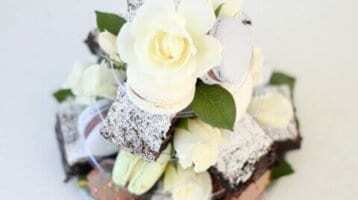 This too is handmade to order to suit your event theme, including freshly cut flowers and foliage direct from our local market. Are your tastebuds getting excited yet?! This is one of our most popular options. 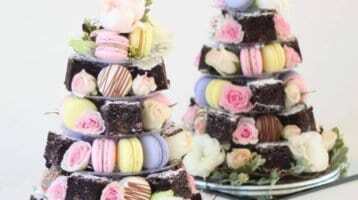 If you’re having a slightly larger event, you might like this 8 tier macaron tower that holds 30 macarons and 30 brownies. 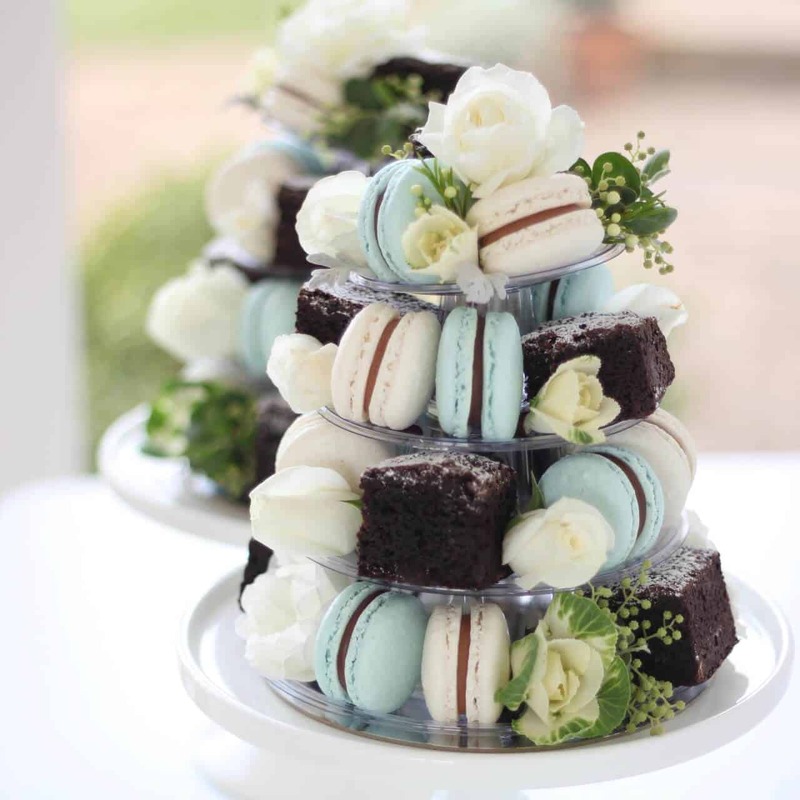 All macarons and brownies are made using only the finest ingredients, including free range, farm fresh eggs and luxurious local ingredients. 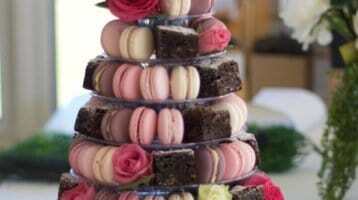 This beautiful 10 tier macaron tower holds 100 serves and is truly something to behold. 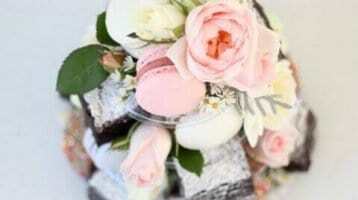 It holds 50 french macarons, and 50 belgian chocolate brownies, as well as fresh cut, local seasonal flowers.